It's been a long time since i found a brilliant and really piercing article. This one nailed it in my proverbial head. Disturbing and all the necessary adjectives that I can conjure is how I would describe this piece of writing. Does Kate Middleton really want to marry into a family like this? tainly coldly accurate about the romance quotient of the last two major royal couplings, which brought the vapid disco-princesses Diana and Sarah (I decline to call her "Fergie") within range of demolishing the entire mystique. And, even if the current match looks a lot more wholesome and genuine, its principal function is still to restore a patina of glamour that has been all but irretrievably lost. The British monarchy doesn't depend entirely on glamour, as the long, long reign of Queen Elizabeth II continues to demonstrate. Her unflinching dutifulness and reliability have conferred something beyond charm upon the institution, associating it with stoicism and a certain integrity. Republicanism is infinitely more widespread than it was when she was first crowned, but it's very rare indeed to hear the Sovereign Lady herself being criticized, and even most anti-royalists hasten to express themselves admiringly where she is concerned. I am not sure how deserved this immunity really is. The queen took two major decisions quite early in her reign, neither of which was forced upon her. She refused to allow her younger sister Margaret to marry the man she loved and had chosen, and she let her authoritarian husband have charge of the education of her eldest son. The first decision was taken to appease the most conservative leaders of the Church of England (a church of which she is, absurdly, the head), who could not approve the marriage of Margaret to a divorced man. The second was taken for reasons less clear. The harvest was equally gruesome in both cases: Princess Margaret later married and divorced a man she did not love and then had years to waste as the model of the bone-idle, cigarette-holdered, gin-sipping socialite, surrounded with third-rate gossips and charmers and as unhappy as the day was long. (She also produced some extra royal children, for whom something to do had to be found.) Prince Charles, subjected to a regime of fierce paternal harangues and penitential cold-shower boarding schools, withdrew into himself, was eventually talked into a calamitous marriage with someone he didn't love or respect, and is now the morose, balding, New Age crank and licensed busybody that we flinch from today. He has also apparently found belated contentment with the former wife of a brother-officer. Together, Margaret and Charles set the tone for the dowdy, feckless, can't-stay-married shower of titled descendants with whose names, let alone doings, it is near-impossible to keep up. There are so many of them! And things always have to be found for them to do. The last few weeks brought tidings of the latest grotesqueries involving Prince Andrew, Charles' brother. If I haven't forgotten anything, he had just recovered from tidings involvingoverwarm relations with the Qaddafi clan when his ex-wife was found to have scrounged a loan from a wealthy American friend whose record, alas, was disfigured by a conviction for sexual relations with the underage. The loan would have defrayed part of the unending wasteful expenditure that is required to keep the Ferguson girl staggering between scandals and sponsorships. I mean, the whole thing is just so painfully and absolutely vulgar. And, among the queen's many children and grandchildren, not by any means exceptional behavior either …. This is why I laughed so loud when the Old Guard began snickering about the pedigree of young Ms. Middleton. Her parents, it appeared, were not quite out of the top drawer. The mother had been an air hostess or something with an unfashionable airline, and the family had been overheard using lethally wrong expressions, such as serviette for napkin, settee forsofa, and—I can barely bring myself to type the shameful letters—toilet for lavatory. Ah, sothat's what constitutes vulgarity! 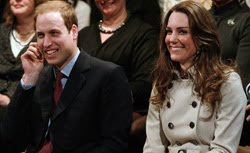 People who would never dare risk a public criticism of the royal family, even in its daytime-soap incarnation, prefer to take a surreptitious revenge on a young woman of modest background. For shame. Happy Birthday to a Good friend and fan of this blog! Lots of love darling on your birthday!! !